REIGNING MEN IS A GOOD WAY TO DESCRIBE THE DANDY AND THE MOD KEEN TO IMPRESS THROUGH FASHION. 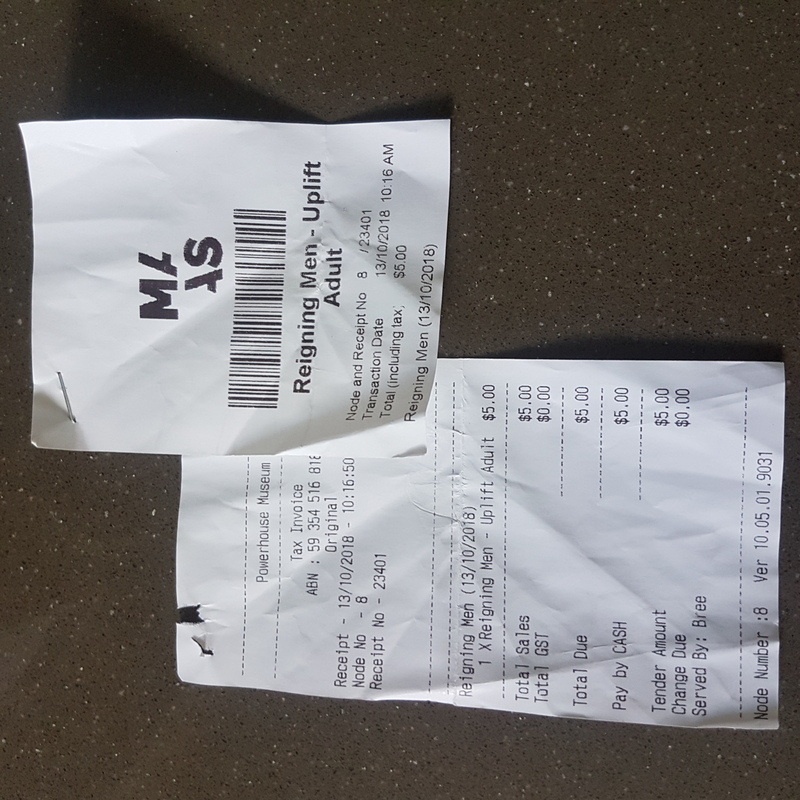 My receipts for the Reigning Men’s exhibition. 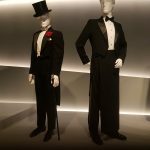 Reigning Men: Fashion in Menswear, 1715–2015 was an unforgettable exhibition at the Powerhouse Museum in Sydney which ran from 2 May to 14 October 2018. It was enjoyed on its second last day of viewing in Sydney before the entire collection was gathered up and transported back to Los Angeles for curatorial attention. The exhibition is to tour again so, if you missed it in Sydney Australia, there is a chance to see it in North America in 2019. The title Reigning Men: Fashion in Menswear, 1715–2015, is correct because the exhibition explores the history of men’s fashionable dress from the 18th century to the present day. It has some amusing pieces such as a 1980s swimming thong, a purple quilted dressing gown with matching smoking cap and a long skirted (bifurcated) tuxedo outfit for formal wear. The exhibition organizers call it “… A riot of colour and style.” Its literatures says the display is the largest and most important menswear exhibition assembled to date, and one which explodes the myth that menswear is restrained. In pouring over the garments with English friends, many items were admired for their display of aristocratic tones which are rarely seen in Australia. Red-purple striped silk for ‘at-home’ lounging. 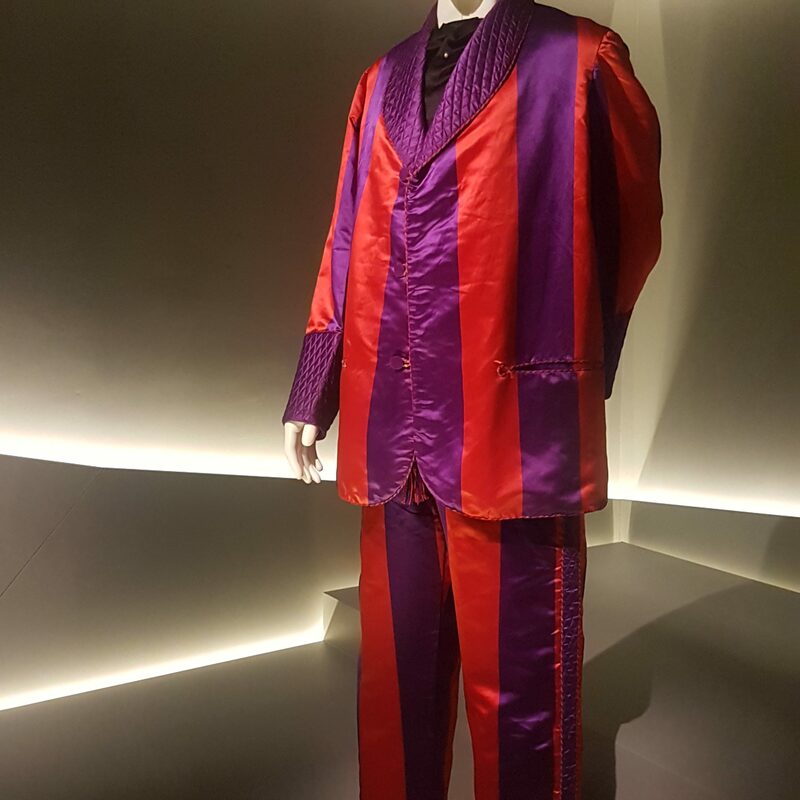 The exhibition literature suggests that: “Beginning with the 18th century, the male aristocrat wore a three-piece suit conspicuous in make and style, and equally as lavish as the opulent dress of his female counterpart. 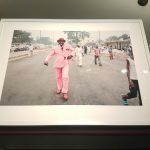 The 19th-century “dandy” made famous a more refined brand of expensive elegance which became the hallmark of Savile Row, London’s celebrated street of bespoke tailors. The mid-twentieth-century “mod” relished in the colorful and modern styles of Carnaby Street, and the 21st century man – in an ultra-chic “skinny suit” by day and a flowered tuxedo by night – redefines today’s concept of masculinity. The exhibition features more than 130 garments by designers including Alexander McQueen, Burberry, Calvin Klein, Chanel, Giorgio Armani, Gucci, Jean Paul Gaultier, Louis Vuitton and Yves Saint Laurent. 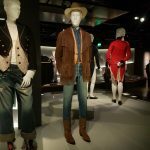 The most familiar American themed items were the Urban Cowboy look and the 1960-70s hippy with patchwork shirt and leather trousers. For fashion and design students, the exhibition makes connections between history and high fashion with relevance to European Imperial and Colonial adventures to Asia and Africa in the 18th century. Text on formal wear and bifurcated items. Formal wear. Note the long skirt on the model (right). While the displays drawing primarily from the Los Angeles County Museum of Art’s (LACMA), fashion collection, the exhibition traces cultural influences over the centuries with examples of European adaptions to cope with extremes of heat, humidity and cold weather. As anyone who has undertaken their national service will appreciate, some of the garments exhibit how elements of the military officer uniform have profoundly shaped fashionable dress in the 20th century. A surprise element for traditional or conservative gallery patrons is how some garments reveal that cinching and padding the body was, and is, not exclusive to women’s fashion. Shoulder padding and cod-piece padding were familiar to tailors in the 19th century. 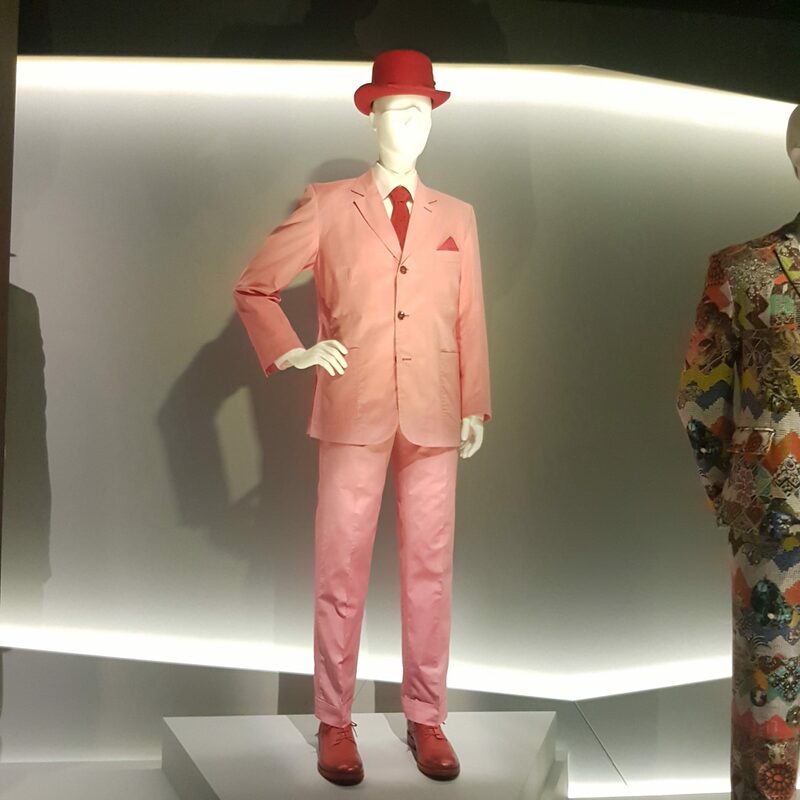 The Reigning Men exhibition was organised by LACMA and presented in 2018 by the MAAS Centre for Fashion in Sydney. This Fashion Centre is Australia’s first public centre for fashion excellence which it claims fosters creative excellence, scholarly inquiry and public curiosity. Original photo of SAPE wear in Jamaica. 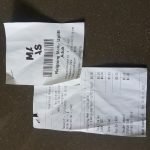 Display text on SAPE wear. 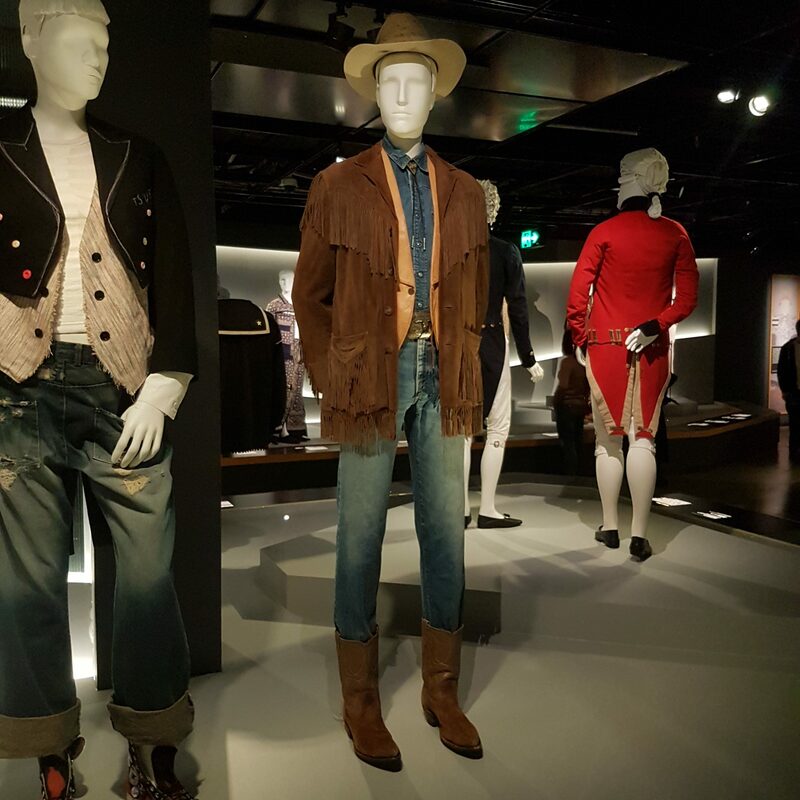 We enjoyed our viewing of this fashion exhibition in Sydney; it was worth the special trip to see so many people admiring the diverse range of men’s clothing manufactured through the ages. 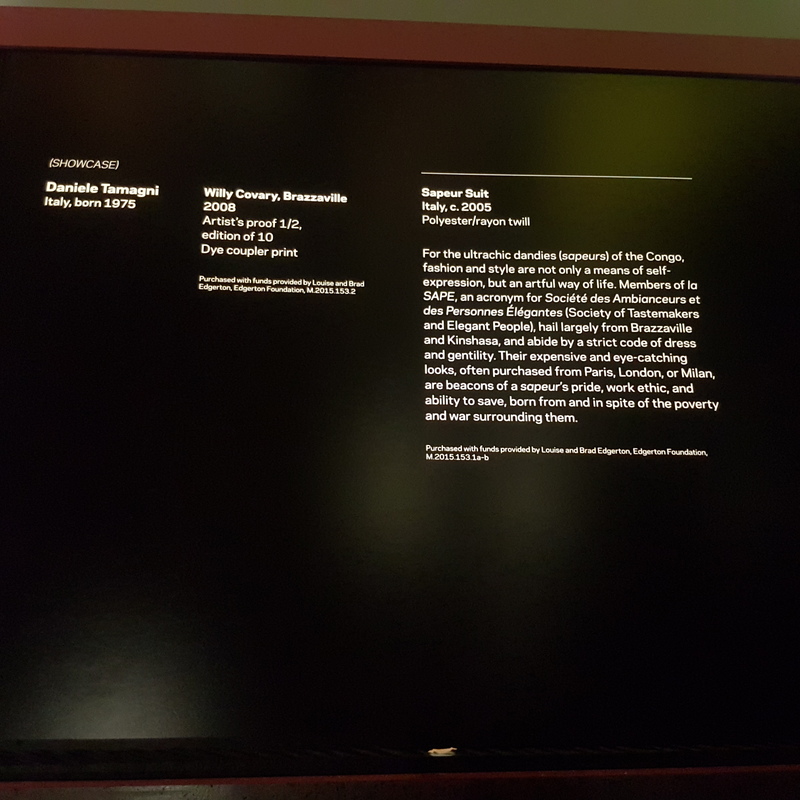 The only downside to our visit to the the Powerhouse Museum was the insistent gallery attendant in the exhibition area who wanted to shake each patron’s hand and find out a little more about their clothing stories. The Toby Jug attendant was followed up by a market researcher with a clip board who also asked question not necessarily appropriate for the exhibition. I was leg sore after ten minutes of listening to their talking and could not find a place to sit down. 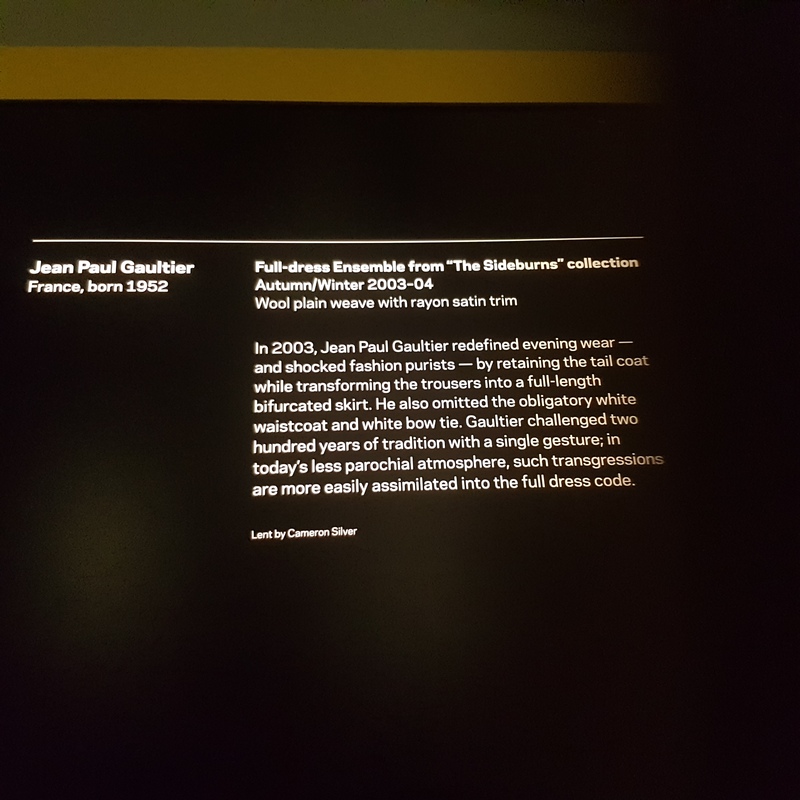 Where were the exhibition’s resting seats? 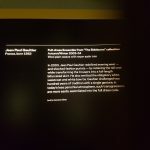 To be met by the functionaries on exiting the exhibition would have given patrons greater choice of how to respond to the market research inquiries. 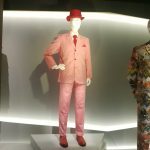 The LACMA’s display exhibition book which accompanied the exhibition, Reigning Men: Fashion in Menswear, 1715–2015, looked a hefty tome full of colour plates and history on each garment. The display book was on the ticket counter as we left the exhibition. It would be a valuable resource for any textile, design, fashion or costume student or practitioner. Unfortunately we weren’t able to purchase the display copy at $50 and all other copies had sold out. So, we look forward to viewing a copy soon if available again through the bookshop at the Powerhouse Museum in Sydney. 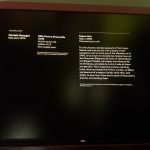 Text copyright: Fiona Rothchilds 2018 with acknowledgment of exhibition literature (MAAS), Los Angeles County Museum of Art and the Powerhouse Museum. Photo copyright: Fiona Rothchilds 2018. Menswear is more than just a fig leaf.